Terry Winters, Wave Hill, 2011. Oil on paper mounted on composite board, 32 1/8 x 44 1/8 in. 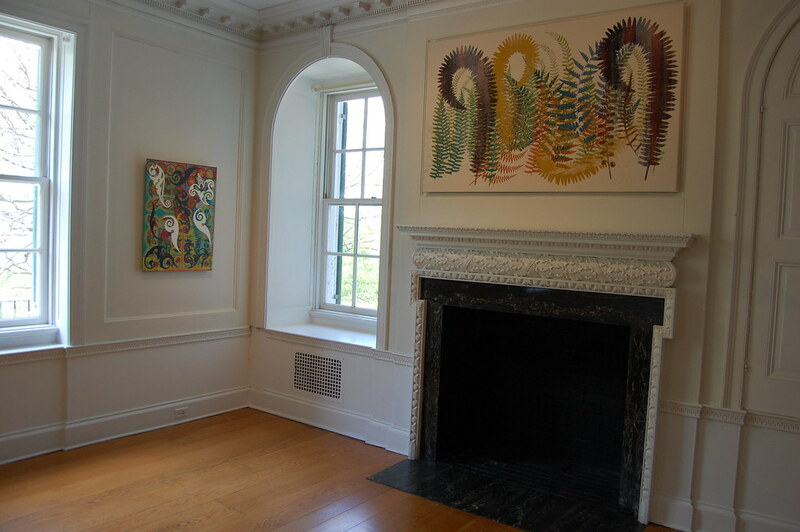 Bringing together Philip Taaffe, Fred Tomaselli, and Terry Winters for an exhibition in the luxurious galleries of the Wave Hill garden and estate in the Bronx is an idea that feels so right that it is a wonder that it had not been done before "Alchemy & Inquiry," which opened there last month. Each artist, after all, has spent decades honing a rich pictoral language that channels and sometimes embodies the complexities of nature. Think of Taaffe with his intricate, organic patterning and washes of color; Winters with his rough-hewn, almost grimy geometries; and Tomaselli with his swirls and bursts of pure abstraction. They're all natural intoxicants. 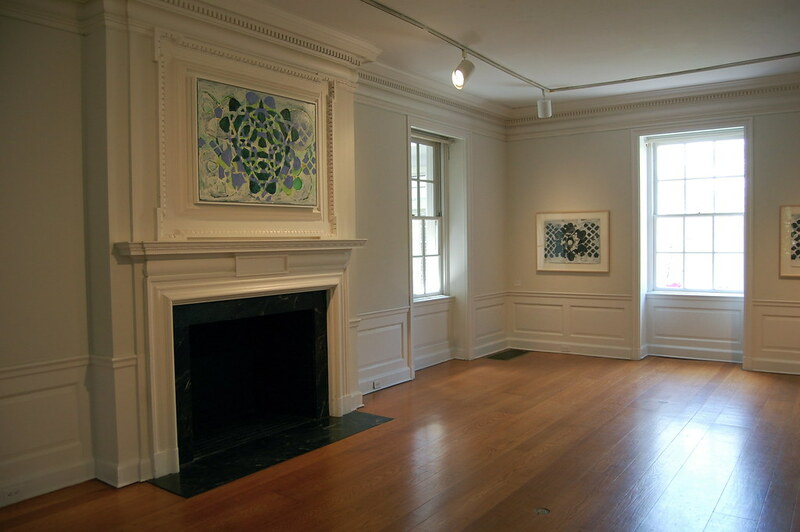 The three artists produced most of the work on view after making a joint trip to Wave Hill last fall, so many of the pieces were, at least to some degree, designed with the fine interiors of the 1927 Glyndor House in mind. How they will look when they hang in the James Cohan Gallery in Shanghai, the show's next destination, is an open question. Most of them look superb in this tranquil domestic setting, but its Winters' paintings that hold up best — earthier, but equally gentle, counterpoints to the room's low ceilings and elegant moldings. 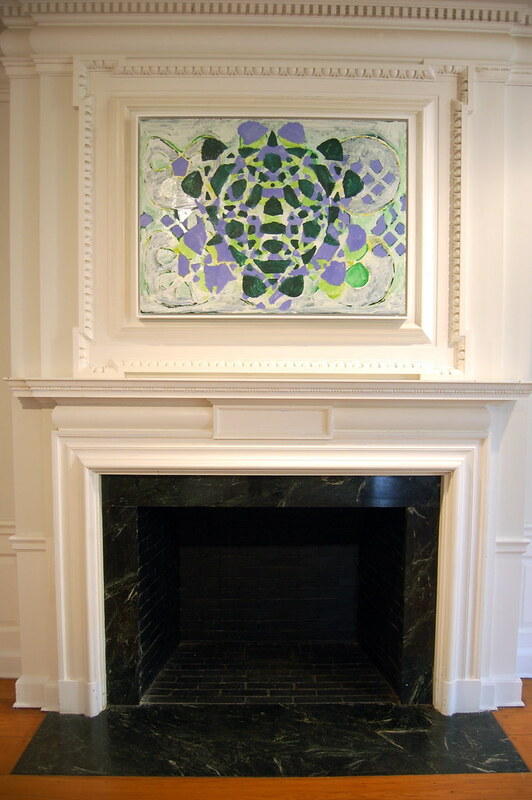 Every fireplace should have one above it. For Winters, abstraction holds a key to the mystery of evolutionary origins — origins revealed to us in the advance mathematics of Chaos and Complexity Theory and the "other possible states" of Painting. For him Nature is not only flora and fauna but the deeper principles on which the world is structured. 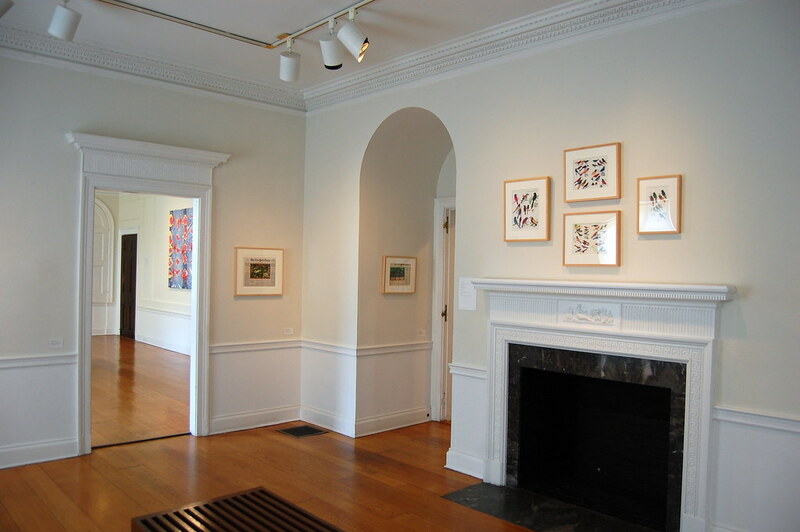 Fred Tomaselli works hang above the fireplace; a trove of Taaffes resides in the next room. If psychedelic art had become the actual folk art of an isolated community, say in the hills of North California, and this 1968 Shangri-La had lived on unvisited by the outside world for several centuries, you would expect their art to have remained psychedelic but to have evolved, been refined and rectified, become intricately craftier and more anonymously baroque over generations of tribal tradition. In effect, you'd expect something like a picture by Fred Tomaselli. Tomaselli is our shaman, and our Archimboldo, the LSD generation's house-artist, of course now slightly amused, always, by how much has gone down, but also always (once again) ecstatic. Sees All, Knows All — but is not bored. 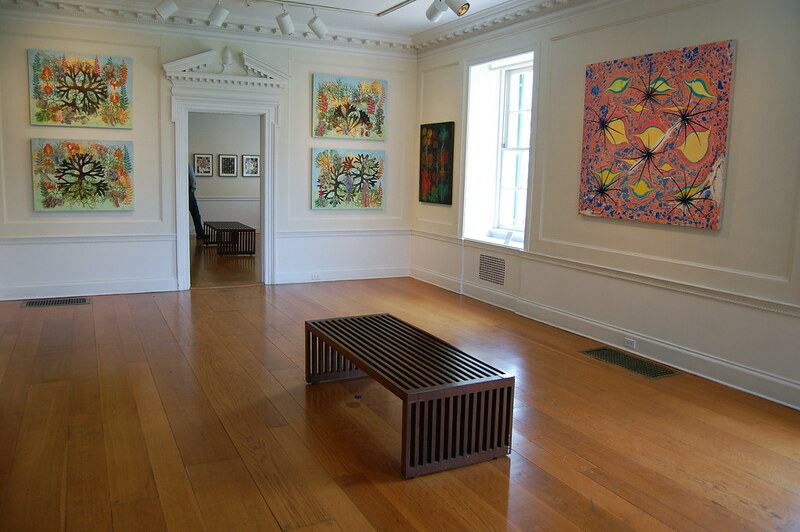 The most effervescent room: four walls of Taaffe paintings. A tiny Taaffe in the corner, another above the hearth. 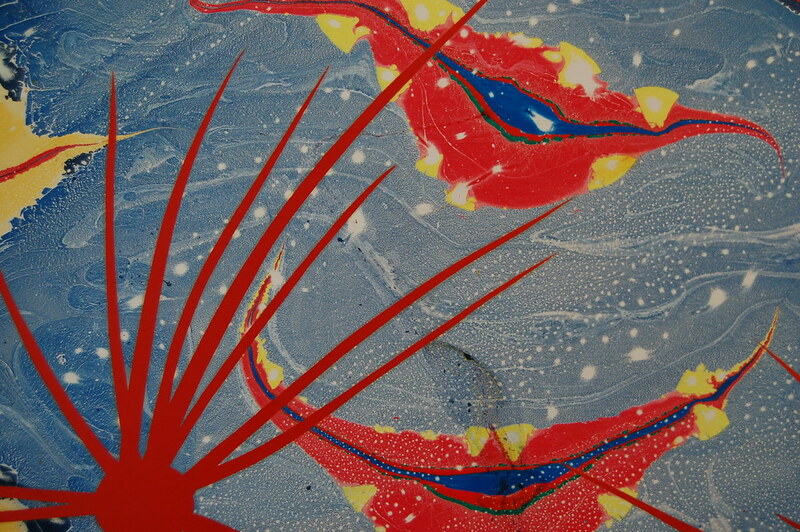 Philip Taaffe, Opuntia Variegatus, 2011. 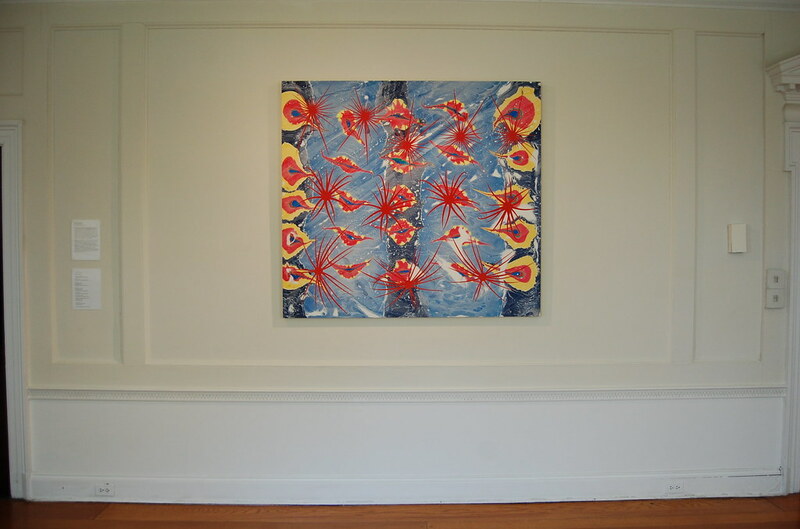 Mixed media on canvas mounted on panel, 53 1/2 x 59 in. That “other world” Taaffe refers to would of course be the Mundus Imaginalis, according to the philosopher Henry Corbin, the world of Archetypes, or the Creative Imagination. Nothing could be more germane to our consideration of all three artists as — can we say, deeply influenced by Hermeticism — or would it be fair to call them something like the “New Hermeticists”? Nowadays, most artists and writers shun the label “avant-garde” and refuse to belong to any movement or school — but for me Hermeticism is, indeed, the “eternal” avant-garde, the everlasting rebellion of love and beauty against oppression and enforced stupidity.